Removing the weight from underneath your hair. The bulk-removing benefits of hidden shorter layers actually coerce the hair to hang more gracefully and styles effortlessly. We call it a haircut, with a secret, aka hair cutting magic. 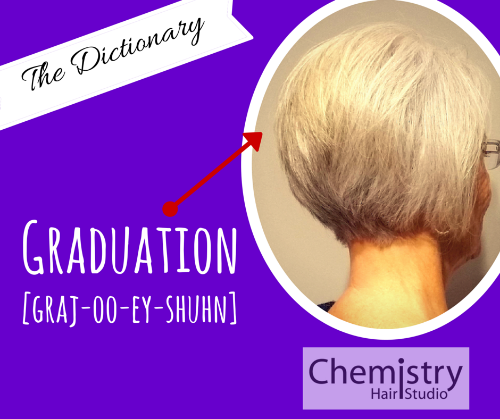 Graduation: A cutting technique in which there is a significant and gradual build up of weight, typically in the back, that adds strength and style to many different looks. It's a common misconception that fine hair is thin and coarse hair is thick, but when it comes down to it one doesn't have much to do with the other. When you are talking about thick vs thin hair we are talking about hair density. In science, density refers to mass per volume. If you relate this to hair, we are describing how much hair is in a square inch of scalp. If you have thick hair you are going to have tons and tons and tons of hair living in a square inch of scalp, if you have thin hair, you will have more visible scalp per square inch. Texture refers to the actual hair strand itself. If an individual hair strand is wide, or large in circumference, we would call that a coarse hair strand. If a hair strand is incredibly skinny in width, we would call that a fine hair strand. Therefore, any combination of density and texture can exist.. One can have thick coarse hair, or thin coarse hair, as well as fine thick hair or fine thin hair. I bet you are thinking. "So why does this matter?" Because: They key to any great hairstyle or haircut is knowing what you are working with. And beyond that, taking what you’ve got and realistically embracing it to its fullest potential to look your best.